I was lying on my bed, unable to sleep due to the thunderous rain pounding against my host family’s aluminum roof, watching the bugs gather around the single candle that provided light to my room when the electricity had gone out. A thousand thoughts ran through my mind. What was next for me? For the past two years, I had known exactly what my mission was and where my ministry was focused. In less than a month, my Peace Corps service would be coming to an end, and I would be leaving Peru for good to return to the USA. What did God want me to do from here? I had no idea, and things did not seem to be getting any clearer. About a month after returning to the USA, I got an answer. After fruitlessly applying to enough jobs to drive a person insane, an interesting email appeared in my inbox. It informed me that there would be a job fair with government agencies in Washington, DC for returned Peace Corps volunteers. At first, I could not possibly imagine how I would be happy working for the government. However, my current job searches had been pretty barren, so I wasn’t exactly in any position to turn down a lead. That’s how it happened that one week later, I found myself in a suit and tie for the first time since graduating from college, resumes in hand, and drenched head to toe in the DC humidity. I looked over the list of agencies that would be represented at the job fair, trying to identify any that looked even remotely interesting. I read down the list until I saw one that I had actually heard of before—Department of Labor. With a plan of attack in mind, I went into the job fair and made a beeline right to the Department of Labor’s table. And it was at that point that the woman stopped me. She said that they had been asked to look for an Economics person. Would I be willing to do a short interview right then and there? I followed her to a back conference room where I met the woman who would become my boss—later that day. As I drive home from the job fair, my phone rang with the job offer. One week later and suddenly I found myself going to my first day of work for a job that I knew literally nothing about. “Sometimes, God puts us in situations where we are best fit to serve Him whether we realize it or not.” In my case, that could not have been truer. I am now working with a government program called American Job Centers. We support a chain of brick-and-mortar centers across the nation staffed by trained job counselors, and these job counselors provide in-person and online information to individuals who need help in a career search. The counselors assist individuals who have lost their jobs to enroll in community college, they work with immigrants to find English proficiency classes, and they help foster youth get the necessary documentation to begin a job search. From the DC office, I use my Economics background to provide economic and employment information to those who work in the job centers. While I enjoyed the job from the beginning, the true Kingdom aspect of it was revealed to me in my fourth month there. I came into work as usual, shook the snow off my Cole Haans, and got my mug of Orange Tea to fight off the freezing January cold outside. Settling in, I began to check my morning email. One of the emails was from a job counselor at an American Job Center in Kentucky. The counselor was sharing a success story about one of her clients, the daughter of immigrants from Panama. The client had come in two months before, looking for a way to start a career. The counselor used information I had given her to set her client up with an apprenticeship as a retail manager trainee. The email went on to say that, two days prior, the client called the job counselor to inform her that she had been hired as one of the store’s full-time managers. This story smacked me like a brick. I realized that my job is not just a place for me to develop skills for future ministry; this job is my new ministry. God has shown me that equipping people with the tools they need to make careers is that way I can do my small share in building His Kingdom. 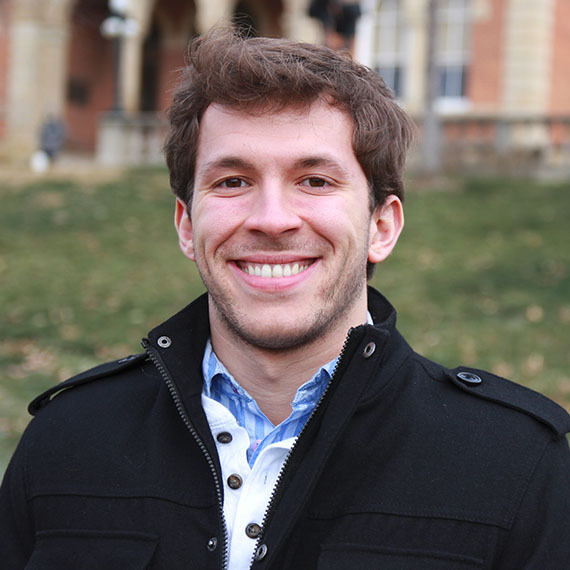 —Alexander Nallin graduated from Washington & Jefferson College in 2013 with a double major in history and economics. He is currently employed at the Department of Labor and is also a Candidate at Officer Candidate School for the United States Marine Corps.